Polymer Concrete Market size was over USD 440 million in 2017 and is projected to expand at over 3.5% CAGR over the forecast timeframe. Rapid urbanization primarily in Asia Pacific has led to strong growth in construction industry which has subsequently driven the polymer concrete market demand. For instance, construction industry in Asia Pacific is projected to grow at a CAGR of 7% in the near future which in turn will have positive impact on the polymer concrete market size by 2025, due to its added features such as long life and low maintenance cost. Construction of innovative and high-end buildings embedded with new technology are requiring polymer concrete to construct the structure durable and resistant in all conditions. Polymer concrete is formed by the composition of polymers by replacing the cement to increase the binding power and longevity of concrete. Rising construction activities in MEA is also one of the major factors which is projected to make valuable contribution to the modified concrete market size by 2025. High cost of the resins, acrylates and fibers compared to conventional concrete is likely to hinder the overall modified polymer concrete market size in the projected timeframe. Moreover, limited product knowledge in some regions is likely to impede the overall business size during the forecast span. However, evolving construction industry along with adoption of new construction techniques (product innovations and engineering advantages) in LATAM, MEA and Asia Pacific will generate copious opportunities to the polymer concrete market size over the expected timeframe. Polymer modified concrete (PMC) are projected to grow at a CAGR over 3.5% by 2025. PMC are a category of polymer concrete where cement in the concrete is mixed with various polymers without completely replacing the cement to provide it with advanced binding properties. Polymer modified concrete are generally less expensive than polymer concrete and are frequently used in restoration work when construction time is limited. They are used to swiftly repair structural concrete. The quantities of polymers required for polymer modified concrete are relatively low, it ranges from 1 to 4% by mass of the composite. The properties of PMC such as impact resistance, abrasion resistance, additional tensile strength and durability will positively boost the polymer concrete market size by 2025. Epoxy in polymer concrete market generated maximum revenue over USD 120 million in 2017. Favorable properties such as moisture resistivity, high thermal stability, adhesion, mechanical strength and heat resistance make epoxy the highest used resin in the polymer concrete. Increasing disposable income of the customers globally are raising the construction and infrastructure industry profoundly, which is positively driving the maximized use of epoxy in concrete to increase its binding power and longevity. In India, Make in India initiatives are working on several public construction projects under the Smart City Program. These projects are incurring a large use of these concretes which is directly expanding the polymer concrete market size by 2025. Polymer concrete market for containments is expected to grow at a CAGR over 4% in the forecast period. Rising concerns for pollution, safe environment and proper sewage are requiring concrete containments, that is directly augmenting the modified concrete market in the near future. For instance, in 2017, China being the largest emitter of carbon dioxide, has announced to cover up their drainage and sewage areas with concrete containment slabs. This would expand the polymer concrete market size copiously in the forecast period. The polymer concrete containment slabs possess greater barrier property due to the lesser pores in the concrete, better moisture resistivity etc. The aforementioned properties will ensure swift growth of the modified concrete market in the projected timespan. Asia Pacific generated maximum revenue over USD 250 million compared to any other region due to the increasing government investment coupled with rising urbanization for major projects across residential, commercial and industrial sector will make prominent contribution to the market size in the forecast period. For instance, Indonesia’s spending on infrastructure is projected to surpass USD 165 billion by 2025 which will have a considerable impact on the polymer concrete market size over the estimated timespan. Enormously growing construction activities in countries such as India and China are expected to drive the demand for polymer concrete by 2025. 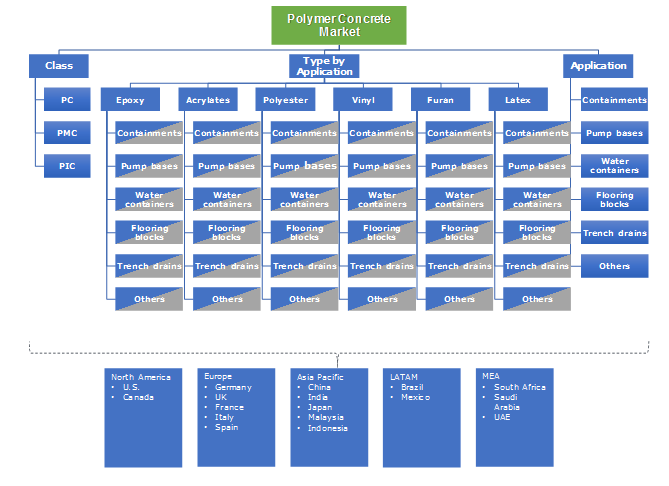 Polymer concrete market share is competitive due to the presence of various prominent industry share contributors i.e. BASF, Forte Composites Inc, Bouygues S.A., Wacker Chemie AG, ACO Group of Companies, Kwik Bond Polymers, Fosroc, Sika, SAUEREISEN, ErgonArmor, Mapei and Crown Polymers. 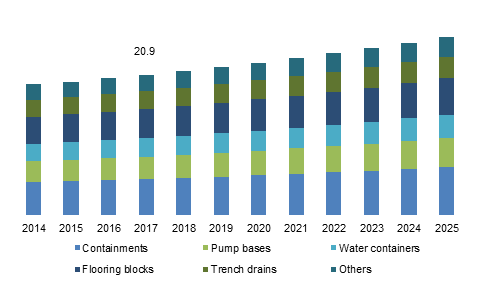 Key polymer concrete market players are expanding their product portfolio with new and innovative products to gain competitive edge over other manufacturers. For instance, BASF has come up with a new rapid setting methacrylate repair concrete named as MasterEmaco S 6000 which is solvent free, durable to withstand freeze-thaw damage, high strength & excellent bonding capabilities and UV resistance that protects product performance from sun exposure. Polymer concrete are a type of concrete in which the cement is replaced or mixed with various polymers to increase its binding property, moisture resistance, better adhesion etc. The product is classified into 3 different class i.e. Polymer concrete (PC), Polymer modified concrete (PMC) and Polymer impregnated concrete (PIC). Resins such as epoxy, acrylates, polyester, vinyl, latex and furan are mixed with the concrete to provide it with various additional properties. The growing construction sector in Asia Pacific has been providing a great surge to the polymer concrete market size by 2025.